IoT technology offers companies more possibilities than ever before, says Cisco CEO. The growth of the IoT has been one of the biggest technology trends of recent years, as more and more devices get smarter and more connected. However it isn't just consumers who are seeing the benefit of the Internet of Things, as businesses around the world increasingly get their services and products online. The challenge now appears to be, how can your business make the most of IoT technology? 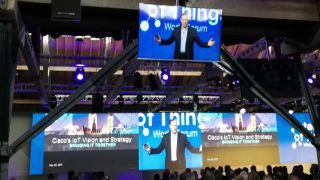 Speaking at the opening keynote of the Internet of Things World Forum in London today, Cisco CEO Chuck Robbins addressed the huge potential and business advantages that the IoT can offer. "Everything is more complicated than it has ever has been," he told attendees, "the complexity of doing IT has shifted significantly over the past five or six years." "We all have to move faster," Robbins noted, "and we also have to show greater agility, and be willing to shift...and fundamentally change how we think." "Everybody has to have this mentality...technology no longer enables a (business) strategy - it defines a strategy." Cisco has become one of the world's leading enablers of IoT technology, with the company keeping a keen eye on the state of connected affairs around the world. Robbins highlighted recent research undertaken by the company which showed that the number of connected 'things' overtook the number of new phones and tablets for the first time in Q3 of last year - a trend which now will not be reversed. Over 8.4 billion 'things' are now connected worldwide, the company found, 3.1 billion of which are being used by businesses - providing a huge $1.29 trillion benefit to companies of all sizes and in all industries, across the world. The market is showing no signs of slowing down either, as estimates predict that by 2020, a million new connected devices will be added to the internet every hour - demonstrating the huge reach of IoT technology. "(IoT) is happening now, and it's happening fast - and it's happening everywhere," Robbins said. "As technology infiltrates everything...you're going to build partnerships with companies that you've never dreamed you would, in order to be successful."